Two-dimensional drawings are no longer the only way to describe our designs. Clients and architects alike are utilizing 3D printing and virtual reality to bring projects to life and make design decisions. These technologies make the architectural design process accessible even to those who cannot comprehend the drawings. The benefits of 3D printing and virtual reality to the design process are unlimited. With the advent of 3D printing technology, we are now able to give clients pieces of their home to touch and feel. 3D printing allows us to create architectural models quickly and precisely. Primarily, we use 3D printing to show details of a particular part of a piece of a home such as an ornately carved wall panel or column. We can even construct a bird’s eye view model of the entire exterior of the home. When clients can get a true feeling for the sense of space or detail, they feel much more comfortable in their design choices and the process. Beyond 3D printing, virtual reality adds yet another opportunity for clients to experience their home before it’s built. Using virtual reality software and glasses, clients can actually walk through their home design. (In some ways, it’s much like a video game.) The design of the home is built within the virtual reality software so that it is perceived to scale with the client “walks” through it. This powerful tool helps clients get a true feeling for the flow of a home and where things are located prior to construction. Through virtual reality, I am able to communicate the intent behind the design. Virtual reality elicits a visceral response in the viewer, just like physical architecture. Some clients love it so much they’ll spend 30 minutes “wandering” through the hallways of their future home. Despite all the technology available, I continue to sketch out all of my design by hand first. This simple action grounds me in the details of the home. Simply put, it’s how I’ve always done it and I feel more comfortable beginning my design process with pen and paper. But there is room for the new in my old school approach and I enjoy watching clients “see” their homes for the first time. In one way or another, all projects begin and end with one simple concern: cost. No matter the size, the budget allotted to a project is either near or at the heart of all design decisions. When allocating funds to a new construction or home renovation project, it is important that sufficient money be dedicated to ensuring the functionality of the home. As I’ve said many times before, good design must be both beautiful and livable. I understand why homeowners come to me ready to dive into the details of their project. Truly, there are many fun and exciting decisions to be made about cabinets, appliances, materials, fixtures, and finishes. But, there is little joy in designing a perfect kitchen on paper only to realize it will not fit within the homeowner’s budget. This is why I have a specific design process that I like to follow for each project. When I’m working on a design, I find myself less concerned with the final details at the start and rather more concerned with how many linear feet of cabinets or square feet of flooring are required. I like to look at multiple levels of appliance packages and lighting qualities. A kitchen could be beautifully decorated, but if it does not provide the cook enough space to work in it is useless. I also take into account how the space serves its homeowners. Hallways must be wide enough to maneuver in, the flow of the rooms in the home must be in order, and the materials should stand up to their intended uses and the space in which they are located. Once the floor plan is clear, we can revisit the budget to see what appliance package makes sense for the kitchen and what kind of flooring is both affordable and attractive. By deciding on the budget before and during the design process, homeowners save themselves time, frustration, and money. As I work with clients during the drawing process, we start with the big issues and overall vision and work down to the minutiae. This ensures that all key components of good design are examined and decided on before the project begins. Seeing renovations come into being can be fun, not a stress. As an architect, I regularly design projects that utilize luxury materials like Carrara marble, travertine tile, and high-end appliances. While it’s enjoyable to anoint a space with the finest finishes, a client does not need to have an endless budget in order to achieve good design. When designing a new project, I lavish the same attention to detail, scale, and proportion on it regardless of the size or scope. A well designed home or project should be born from the notion that form and function must work seamlessly together. During a project in a neighborhood near our Dallas office, we used rather mundane exterior materials to great aesthetic effect. Off-the-shelf cementitious siding was transformed into an interesting and patterned façade. Doric columns set off the front door. A pergola over the front porch adds depth, while a small shed roof and balcony on the second floor add yet more dimension and visual interest. Rather than use regular shingles for the entire roof, metal roofing was added to set off select areas like the entryway and a few other windows. It is always important for us to find a willing partner in such a process. We were able to work with a contractor who shared, even drove, our vision and they were able to execute this project at the highest level. The Greenwells’ ability to craft the materials chosen for the home’s exterior brought our vision to life. When working with ordinary materials or a limited budget, some homeowners may feel like their options are limited. I’m glad that I can share this project with them as an example of the kind of extraordinary project that can be achieved when good design is the priority. 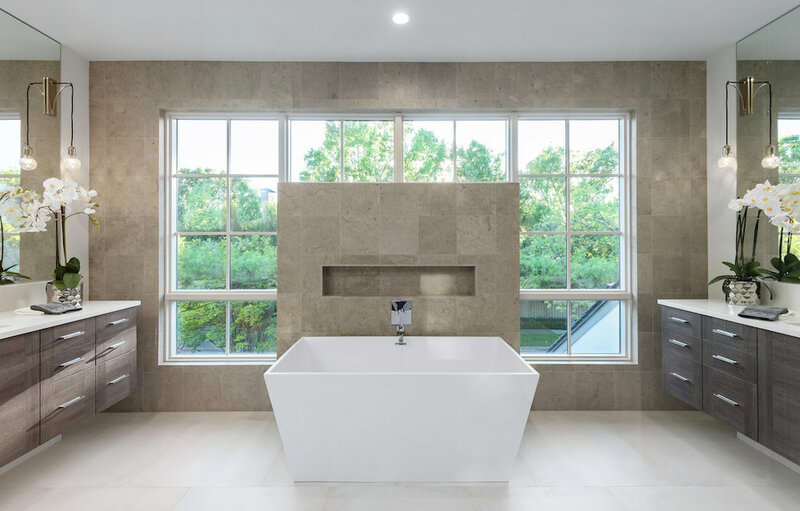 When it comes to new home construction, or renovations, homeowners naturally focus on the aesthetic aspects of the project such as fixtures, colors, and finish materials. There are also a number of practical areas that need attention during the drawing process. Structure, safety, and security all demand special attention. In fact, comprehensive drawings should include details and information on the visible and invisible aspects of your house. Thoughtful design can actually reduce your insurance costs. I’ve worked with insurance agents over the last thirty years to better understand how to incorporate both obvious and latent elements into every home we build so that we can reduce a homeowner’s insurance liability. There are a surprising number of smart tweaks that we can include in your blueprints that protect you and your home. For example, in tornado-prone Texas, we design homes with windows and framing that are prepared to accept a higher wind load. We look closely to Miami Dade’s wind resistance code. Since they are established for hurricane winds, we can build a stouter house. Other less obvious measures include using gas and water flow detectors; whole house shut off valves for gas, water, and electrical; detectors for smoke and water in crawl spaces; and maximum hail protection for your roof. You can even reduce risk to the home during the construction process by prohibiting welding after 3 pm. Home security is also an important consideration during the drawing process. Any entrances to the home should be alarmed, including garage doors and gates. This can be set up with the local fire department so they would have access to the home in the event of an emergency. Alarm systems can also be connected with local police departments and alarm panels can be placed in conspicuous locations around the home and made easily accessible. With Texas’s penchant for dramatic weather changes and our need for safe and secure homes, it’s easy to understand why any homeowner is glad to see these precautions put in place. While all of these enhancements to your drawings do come with minor expenses during construction, they will pay for themselves many times over throughout the years. I’ve always enjoyed tackling any kind of project, as long as good design was at the heart of it. From an 8,500 square foot home to a porch- there is no difference is the level of detail and skill that we bring to the table when crafting drawings. Recently, we received a request for a desk. This client, whose home we had worked on years ago, was going on sabbatical doing research and wanted to create a built-in desk to keep his work in order. 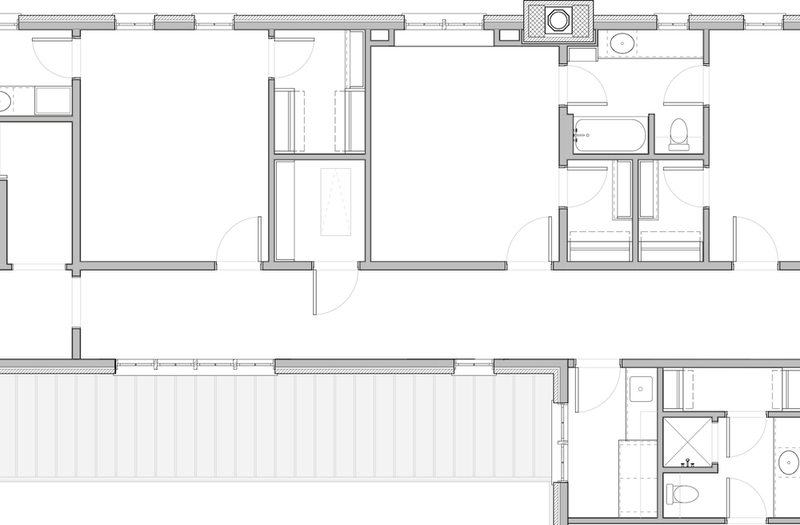 Working within only an 8-foot space, we drafted drawings to meet his exact specifications. The planning included moving electrical outlets, relocating a wall, and adding sconce lights. When finished, this desk will become an integral part of the home and serve our client for years to come. If you’ve decided to build a new home- congratulations and welcome to one of the most challenging and exciting projects of your life! The “to do” feels long right now, but in the end, living in your custom designed home will bring you years of joy. With any home project, the step is finalizing a budget. How much money you have available for your new home will determine not only the size and layout of the home, but also the finishes, appliances, and character elements. Generally speaking, new construction homes cost more per square foot than a home renovation but that doesn’t tell the whole story. It’s virtually impossible to come up with a neat and tidy square footage price that includes all elements of the price from materials to labor. Once we have a good handle on the budget, it’s time to start designing. Beyond knowing the number of bedrooms and square footage desired, I like to ask my clients questions about themselves. Often I ask them to think back to their childhood and write a paragraph that describes a meaningful space to them. Whether they write about a bright pink bedroom or a wood-paneled rumpus room, I’m able to glean a lot of information about the kinds of house and spaces they want to build. Personality has a lot to do with design and architecture so it’s important that I know my clients well and understand what makes them tick. Photographs from past or present homes or other sources of inspiration can also be helpful during this process. After the drawings are done, we may want to revisit the budget to make sure that what we’ve dreamed is actually possible. Often it’s helpful to consult with a builder to run construction costs so that there won’t be any surprises after groundbreaking. Often clients ask how long the new construction process will take. It should take the exactly X amount of time. Not very helpful, I know. I wish I could tell you the timeline, but truly it’s important to both take your time during the drawing process to make sure you’ve examined all the alternatives. Taking too long has its drawbacks, though. As time passes, clients can find themselves second-guessing their decisions and changing their minds. This only leads to confusion and delay. I do have one word of advice to anyone looking to build a new home- resist the armchair quarterbacking friends and family are wont to do. Certainly I encourage you to seek opinions and ideas from those you trust, but be wary of soliciting too much advice, only to lose track of your own wants and needs. After all the planning, it’s time to build. Your architect will be available during construction to make sure your designs are implemented correctly. While the process of building a new home requires a lot of organization and planning, it results in a one of a kind piece of architecture. Enjoy the process! As we conclude our series on older homes, I’d like to spend this time discussing ways to keep your older home both functional and beautiful as it ages. All older homes, even those that are not on a historic register, deserve to grow old gracefully. Even still, your home may have significance that you haven’t uncovered. If you’re living in an older home, research the house and the neighborhood to discover its hidden history. The local library or historic society often hold records on prior owners and detailed maps of a town’s previous layout. When you find out the context of your home, the significance of your street name, or previous owners, it not only can enhance the enjoyment of your home, but can also potentially increase the value of it. In Dallas, there are not a lot of homes that date back to before the First World War, which makes that small number of homes more rare and interesting. Thankfully, hiring experienced home inspectors, architects, and contractors can easily mitigate most problems that arise with older homes. Do your research when it comes to your home design team. Seek out professionals with prior experience with older homes and great references from homeowners. Despite educated guesses, it is truly hard to know what kind of shape the plumbing, electrical, and walls are in until sheetrock comes down. You should plan on including a financial safety net in your purchase or renovation budget which will take the sting out of any unforeseen setbacks. Thankfully, lots of older homes were built with a crawl space underneath the home. This makes it easy to move plumbing, check ductwork, and even install or maintain air conditioning systems without disrupting the permanent structure. 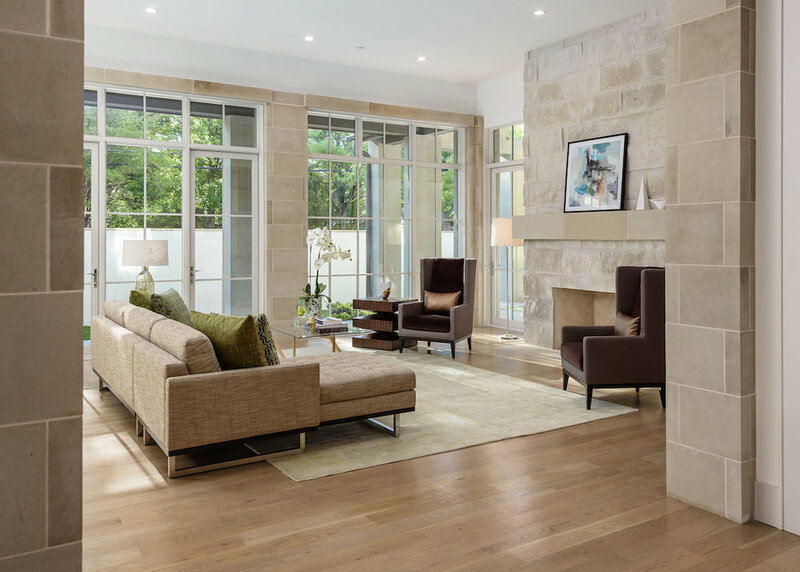 Before you start thinking about knocking down walls in your older home to create an open floor plan, think carefully about the style of the home and why it was built in that particular way. For example, many Victorian homes were created with distinct separation between public and private space. Victorian homes were also built with the family in mind, such that any public space is designed to enhance social interaction. Instead of trying to mold the home to fit your ideals, think of ways that you can furnish and live in your home the way it was intended. Perhaps two smaller love seats and a set of comfortable armchairs could create a cozy sitting area for conversation better than a giant sectional sofa. Finally, let’s talk about your crooked little house. Perhaps your floors are bit uneven or your doorframes slanted. Resist the urge to try and level the house. Leveling a home can actually do more damage than good. Homes and their wooden frames harden as they settle. Any attempts at leveling may crack the existing sheetrock and set up a domino effect of problems. Best to chalk any crooked quirks up to charm and leave it at that unless the problem is extreme. I hope you truly enjoy your older home. It is anchored in your neighborhood, a stalwart of the community, standing time-tested among the years. Its walls are filled with memories, laughter, and life. An older home is not a blank canvas waiting for your customization, but rather a rich portrait meant to be enjoyed by the right collector. The floors may creak and the electricity may need updating, but an older home offers a treasure trove of other features that the right kind of owner will appreciate. What I often admire in older homes is the attention to scale and construction, which was used to maximize organic features like light. Not able to rely on technology, older homes included transom windows atop of doorways to let in air and light. Additionally, older homes usually have a distinct separation between public and private space. While this may mean smaller bedrooms, it also means that the public spaces have been designed specifically to foster community and togetherness for family and friends. Mature landscaping can add color and drama to an older home. Owners of a new house might have to wait for at least 10 years for a magnolia tree to reach it’s full size, but it’s heady blooms, perfect climbing limbs, and shady leaves are waiting for you at an older property. Consider for a moment the big pecan tree on Armstrong Parkway. At over 140 years old, it has become a landmark of the Highland Park community and the site of the oldest community tree lighting tradition in Dallas County. The sophisticated and lush greenery of the Park Cities are one of the key selling features of the area adding charm and ambiance throughout the neighborhood. Benefits aside, older homes do have their own set of unique challenges. Possible health hazards like lead and asbestos must be mitigated before you can move in. It’s also unlikely that you will find an older home with sufficient closet space or enough kitchen upgrades to suit modern tastes. Utilities like electrical and plumbing may need updates or complete overhauls depending on what has been done in the past- and how well it was done. You may find a leaky roof over your head or a sagging deck in the backyard. Not all older homes are maintained with the attention to detail and sustainability that is required. Ultimately, if you find yourself annoyed rather than charmed by the quirks of your older home, than you should buy or build new construction. It’s always a shame to see an older home ruined with endless upgrades and attempts to modernize. Wondering if you are ready for the challenge of loving and living in an older home? Stay tuned for the last article in the series where I’ll talk about how you can protect and preserve your older home for generations to come. It’s time to dig a little deeper and start exploring how architecture and design influence our everyday lives. Homes are more than just the places we live. Houses become essential parts of our lives, shaping how we feed our families, play with our children, and rest at night. I want to delve into how houses change the way the we live and how we can enjoy our lives and homes more when thoughtful design and construction come to bear. What am I talking about when I say, “old house”? By my definition, an old house is any home built prior to 1970. It could be any style- Tudor, Mediterranean, French Chateau, Colonial. It could be a home that’s had one owner for 50 years or another that has housed many families. Size doesn’t matter- an old home could be large or small. Location is also irrelevant. Well-kept old houses blend in seamlessly in newly developed neighborhoods. Old homes offer so many features and oddities to explore. From outdated electrical systems to hidden dumbwaiters, inside each old home is a treasure trove of unique design choices that speak volumes about its prior inhabitants and the time in which the home was built. Rickety attic stairs might lead to a third floor with a vaulted ceiling and gorgeous natural light. A basement might house a root cellar for vegetable storage. New carpeting might be covering gorgeous herringbone hardwood floors. Built-in china cabinets and wall niches offer a place to show and store fine china. Why are we charmed by their quirks, eccentricities, crooked doorways, and creaking floors? I think ultimately it comes down to nostalgia. We see an older home and it tugs at our hearts. A home is more than just four walls. A home is a physical representation of some of our most intimate connections and emotions. In this series, I want to talk about what makes a good old house and how to treat them with the care and respect they deserve. A renovation on an old house can be much more than a rehab project- it can be a restoration. The second article in this series will discuss both the benefits and drawbacks to owning an old home. The third, and final article, in this series will address the various ways that you can handle the personalities and needs of an old house. I hope you’ll join me for this look at old homes and chime in with your own thoughts and experiences. At the April 21st Lambert's Garden Tour hosted by the Institute of Classical Architecture and Art- Texas Chapter, William Briggs participated in a panel discussion the collaboration between interiors, architecture and landscape design. French Chateau architecture is inspired by the 15th and 17th century country estates of French nobility and royalty. You can see the features of the style in the home’s construction, including smooth stone walls and complex roof lines with steeply pitched, hipped roofs, corner turrets, and french ornamentation. Even though the rest of the world may be crazy, I think your home should be a place of calm amongst the chaos. That’s why I believe in design that is intuitive and making spaces both functional and beautiful. A front door should look like a front door- there shouldn’t be any hidden meanings. We are honored to announce that William S. Briggs has won a 2015 John Staub Award for our work at Lee Park. The John Staub Awards “recognize and promote excellence in the classical and vernacular traditions.” John Staub was a residential architect known for his traditional-style mansions built in Houston from the 1920s to the 1960s. Staub’s work blended classical architectural styles with his own design perspectives to create majestic, stately homes. The Allie Beth and Pierce Allman Arbor Pavilion was nominated in the Institutional/Civic/Ecclesiastic/Commercial Architecture category of the John Staub Awards. Is there a rattling in your attic? A hissing noise coming from your basement? A steady drip from your faucet? Is your home slowly driving you crazy? I hate to say it, but you are being haunted. Those are the lingering ghosts of bad decisions. When you should have called an electrician, you called your friend who does wiring “on the side”. When you needed a new furnace, you bought one on Amazon and installed it yourself. Instead of looking for an expert, you found a shortcut and now you are paying the price. When you’re ready to exorcise those remodeling demons, call an architect. Not only can an architect save you time and money through thorough planning and budgeting- they can also save your sanity and help you love your home again.